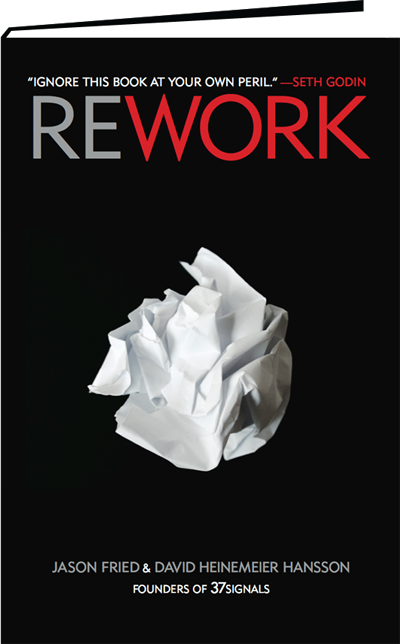 I just got a pre-release version of Rework by Jason Fried & David Heinemeier Hansson (the founders of 37Signals). I'll provide a deeper review when I'm finished with the book, but suffice it to say, if you like to read a series of ditties describing a contrarian business philosophy that works, you'll want to read this book. Great businesses have a point of view, not just a product or service. You have to believe in something. You need to have a backbone. Strong opinions aren't free. You'll turn some people off. Lots of people hate us because our products do less than the competition's. (My note: This thought alone should dry some people's heads and the ones that really grasp it will be the one's that succeed.) ...we're just as proud of what our products don't do as we are of what they do. When you don't know what you believe, everything becomes an argument. Everything is debatable. But when you stand for something, decisions are obvious.